MotoXAddicts | Cooksey’s Hard Truth: Money, Drunk Fans and Controversy: Vegas Baby! On Saturday night Eli Tomac became Supercross history’s third rider to win all three legs of the Monster Energy Cup and take home the million-dollar prize. . . or did he? Tomac clearly won the first two legs of the triple crown, but nobody expected his 450-rookie teammate to be the rider standing between him and a million dollars. Heading into the last race of the night, everyone was focusing on Tomac and a very excited and possibly intoxicated fan Jesse Hebert. Jesse won an earlier contest making him eligible for a million dollars too, if Tomac won. Many would have expected Jason Anderson or Marvin Musquin to be the rider(s) to ruin Tomac’s night, but nobody thought Joey Savatgy would be the guy standing between Tomac/Hebert and 2 million dollars. 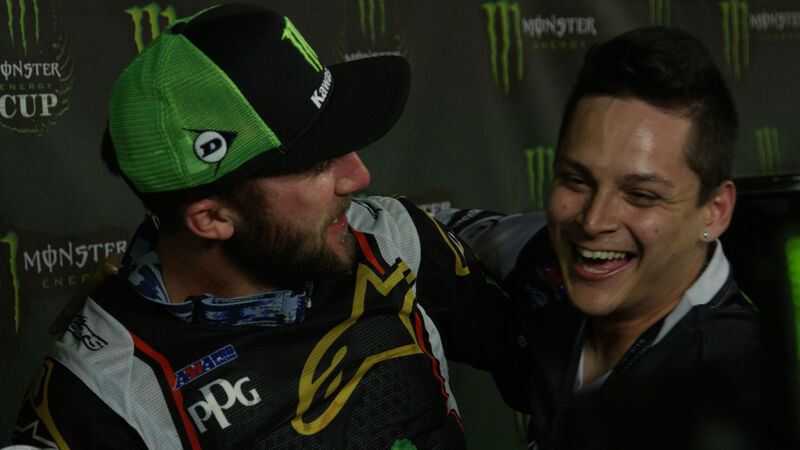 Jesse Hebert celebrates his million dollar night at the races with Eli Tomac.. I mention the interesting likelihood of Savatgy as the guy who stood between Tomac and the million because of how he let Tomac pass, obviously nothing was talked about prior to the final race. Savatgy is a smart guy and probably knew the magnitude of what was happening and clearly didn’t want to spoil the party for his new team. I don’t blame him for pulling over, although maybe don’t wave Tomac past. If he purposely took a wide line or faked a poor drive out of the sand he would have plausible deniability. Typically, a prize of this magnitude is covered by an insurance policy. Had that been the case, this situation could have landed in the court system. Luckily for both Jesse and Eli, according to Dave Prater the money comes directly from Monster and Feld, so I don’t think they will have any issues. Poor Joey Savatgy has had a horrendous year. His results were well below expectations and his selection as the second rider at team Kawasaki has been mocked unmercifully online. Last Saturday Savatgy was proving everyone wrong and showing his talent, but much like his entire 2018 season it didn’t end without an asterisk. Who would have thought simply winning a race would cause so much controversy? Savatgy has a 1-year contract with Kawasaki and 450 rides are really hard to come by, just ask Dean Wilson, Justin Bogle or Chad Reed. If he wins and costs Kawasaki team captain Tomac a million dollars how awkward is their relationship? Much like in team sports having the star player’s support seriously helps with job security. 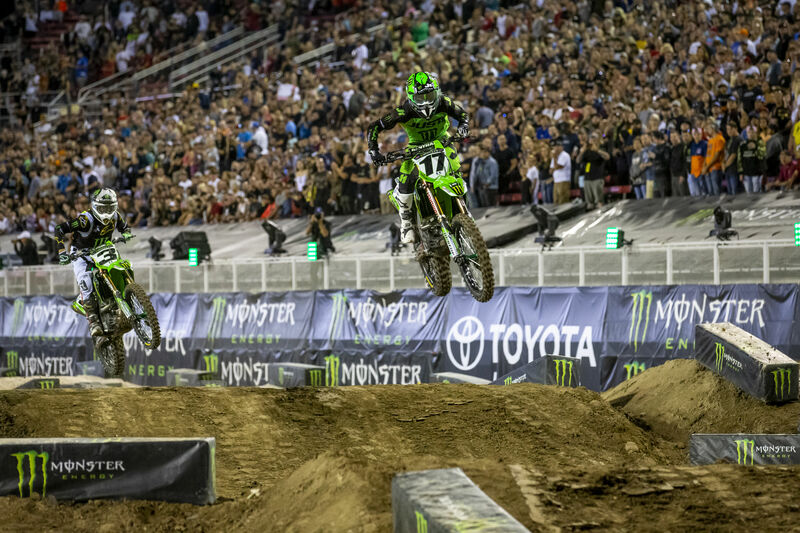 With Eli Tomac (3) closing on the final lap, Joey Savatgy (17) was in the unenvious position of being the only thing between his new teammate and a million dollar payday. It didn’t matter if Savatgy won the race or pulled over, somebody was going to be mad. Much like Marvin Musquin a couple years ago, Savatgy was in a no-win situation but their situations are very different. I believe Musquin’s “pull over” in New Jersey was a team decision that affected the supercross championship. Savatgy simply made Tomac a little extra money for his offseason hunting expeditions, oh let’s not forget Savatgy also changed the life of party animal Jesse Hebert. Neither situation is ideal for Savatgy or Musquin and I am sure both riders would have preferred to win their respective races. While most of us are disgusted by team tactics there isn’t a way to prevent them from happening. It’s strange to think an individual sport witnessed by so many people could have manipulated results, but unfortunately there is no way to prevent “team tactics.” Unless you are inside the brain of a rider and can judge effort, how do you prove team tactics? With that said, if someone openly waves another rider past then they deserve whatever scrutiny and punishment received.